« Another Picture Of Tango Before Sunset. Vesla In The Goat House. The goats are a bit of a mess these days, they’re spending so much time indoors. They need a trim and a brush up. My daughter has said she’ll do it. 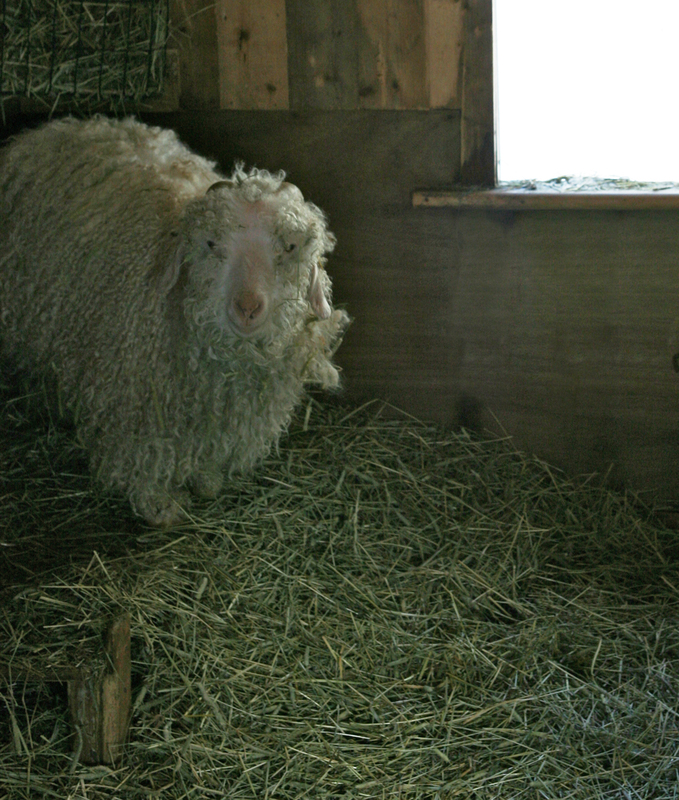 She looks like she has been keeping cozy, snuggling in the hay. Do they eat the hay, or is it to keep warm? No, they’re supposed to eat it. But instead they just throw it all over the place and it covers up all the straw, which is what’s meant to keep them warm. It sounds like they might be acting out in some way. Perhaps they need a goat psychologist. I have heard, though, that no one in Norway goes insane during the long winters because they go outside and talk to trees. This was told to me in all seriousness by an old boyfriend who was half Norwegian, but I never did hear the details of this presumed tree therapy. No, they like to sort through the hay to find the exact pieces they’re looking for and they just don’t really care about tidiness. I’ve never talked to trees, but I think Prince Charles does it. I doubt they talk back. Trees whisper. Well known fact. If they’re just being untidy, I don’t know what you can do, except be glad they’re not your own roommates. It’s their room, they will have it the way they want, but of course I’ve never had children, so maybe I’m being too laid back. The prince may be rehearsing speeches or learning a new language. I just ran across this language guy, a certain ALEXANDER ARGUELLES, who does something called “shadowing” to learn a new language. He’s very long winded, but I find myself getting caught up in whatever he’s talking about. I don’t know the joke. The main difference is that you wouldn’t want to eat straw, but it keeps you warm. Also hay is greener; straw is creamy-yellow. And straw is a hell of a lot cheaper. Okay, hay stacks and straw bales, I guess I’ve seen those. Maybe not hay, I think that got turned into silage? Or maybe silage is the green part of the corn. We climbed on the straw bales stacked some twenty high beside the barn, great fun. I want to say “hay bales”, though, “straw bales” doesn’t sound right. Now you can pay about $4 for a bale of straw for Halloween. decoration. The joke is in the pun hay/hey. In those days “hey” was considered to be slang and some thought not quite proper; the poem was a way to remind people to use more formal language. Some tagged something about grass on the end: “save a little grass for me” or “smoke a little grass for me” — grass was a big giggle/snicker thing that you couldn’t talk about back then, or maybe it was just a way to defang a prescriptionist jingle. I have heard, though, that no one in Norway goes insane during the long winters because they go outside and talk to trees. No, they like to sort through the hay to find the exact pieces they’re looking for and they just don’t really care about tidiness. That’s what my wife says, too. More often about clothes or papers than hay, though. I only ever take items of clothing off the top of their respective piles, but for some reason that is also a Bad Thing. To make the goats behave, just show them this. Wow, she’s got fainting goats. What a great site, I must take another look later. She’s just like us. Except we don’t have a donkey (I’d really like a couple, though). Thank you very much, Language! I suppose the bad side of having the authorities delete your spam is that sometimes they arbitrarily delete comments as well.